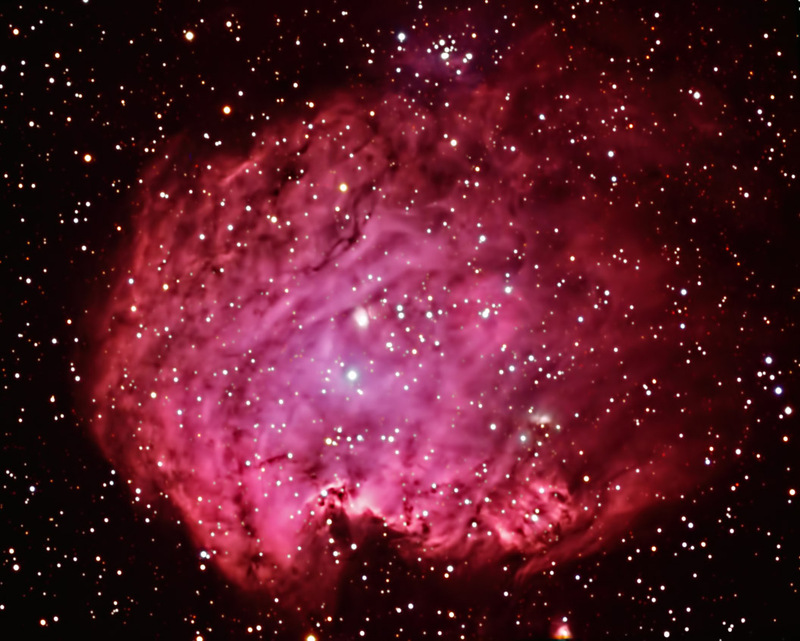 NGC 2174 is an emission nebula that lies approximately 6,400 light years away in the constellation of Orion. It is sometimes referred to as the Monkey Head Nebula (the top of the monkey's head would be at the left of this image). It is associated with the open star cluster NGC 2175. This nebula covers 40 arcminutes, an area larger than the full moon. Ha: 20 @ 7.5 min. (2.5 hr.) R: 12 @ 5 min. G: 12 @ 5 min. B: 14 @ 5 min. Images were focused, reduced, aligned, and combined in CCDSoft. The Ha and RGB images were aligned in Registar and the composite image was created and adjusted in Photoshop. Topaz Detail and DeNoise were applied.